If you are a blogger – especially a new blogger – link parties are a great way to get yourself out there, meet other bloggers, as well as grow your own blog. 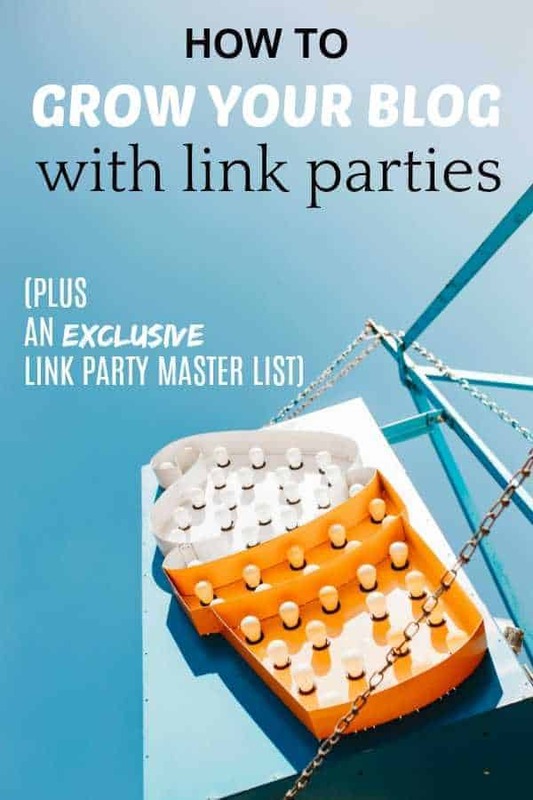 Find out why you should be participating in link parties and get a link party master list, with link parties for each day of the week. Okay, so link parties might be able to help you get more traffic and grow your blog…but, what the hey-doodle is a link party? A link party is just what it sounds like; a party hosted at a blog on a specific day and time where other like-minded bloggers come to share their own links and take a look at other people’s links. Link parties often have catchy names like Saturday Sharefest and Morning Cup of Joe (two of my favorites) and mostly occur on a weekly basis, at the same day and time every week. There are some link parties that occur on a monthly or seasonal basis. Each link party has its own specific rules and themes. Some link parties are for sharing crafts and recipes and others are just for fashion. Certain link parties allow you to share anything under the sun. There are link parties for books reviews, crafts, home decor, parenting, fitness, beauty — you name it and there is probably a link party for it. When you begin to visit link parties, you need to read and adhere to the rules of that link party. The rules are usually shared in the introduction of the link party each week. You can view all the hostesses (sometimes there are multiple) at whose blogs the link party occurs each week. If it is your first time linking up, make sure to comment and introduce yourself to the hostess and community. Not only is it polite, but it’s also a good way to get to know more seasoned bloggers! Why are link parties important? Link parties are typically hosted at more established blogs with a larger readership. The more people linking up, the more eyes on your posts and the more potential to have your post seen and shared by a wider audience. If your post is particularly good and fits what the link party host is looking for, you also have a chance to be featured the following week. That means that your post will be put at the top under the “featured posts” section with a larger image. The host may also pin your post to their Pinterest boards and share across their social media accounts. In fact, that is how my Find the Bunny post (pictured below) ended up going viral in my very first month blogging! Getting featured should be your goal! Make sure you have bright and beautiful photos that will catch people’s eyes…link party links are typically seen as small, square thumbnails. You need images and colors that POP for a chance to get featured. Not only will you get more comments, pageviews, and shares, but being featured by a bigger blogger also has the added benefit of increasing your domain authority and improving your SEO. Domain authority is basically a score of how “cool” your blog is in Google’s eyes. The higher the domain authority, the higher the chances you can rank in Google searches and the more organic traffic that is driven to your blog. Simply linking up to the link party isn’t enough to do this, you need to get featured. Obviously, the bigger the link party is the more potential it has — but it’s also much more competitive! My advice is to find a nice mix of bigger and smaller link parties that fit your niche, so that you have a broader chance of getting features and shares. It can be hard to find current link parties; many link party lists are out of date and riddled with broken links and bygone link parties. Once blogs grow to a certain size, many of them stop hosting link parties to focus on other tasks. This is the most up-to-date link party list currently available. I am not sharing every link party on the Internet. I did look for link parties of a certain size for this list. If you feel that your link party should be added to this list, feel free to send me an email for consideration and I will add your link party to the list. I will also update with more link parties if I stumble upon them. Link parties are listed by start date. Many link parties like Saturday Sharefest actually open for linking on Friday; if you show up on Saturday, not as many people are going to see your link and you risk losing out on traffic. Best to try and get there as early as possible when the link parties open. If I know the start time of the link party, you will see it listed in Eastern Standard Time. Link parties that I have participated in have been bolded and *starred. Inspire Me Monday at 6 PM? Inspire Me Monday at 3 PM? *Recipe and DIY Linky at 6:30 AM? *Dream, Create, Inspire at 8 PM? *This is How We Roll Link Party at 5 AM? *Morning Cup of Joe at 5 AM? *Saturday Sharefest at 8 AM? *Inspiration Monday at 1 PM? This is a great read and it’s wonderful that you shared a list for everyone. Thanks for sharing on To Grandma’s House We Go! Thanks, Chas, hopefully, it helps out some other bloggers! It’s so funny because I found YOU via a link party. I love them because they have brought so many amazing friends in my life in addition to adding page views. I should write a post about that because blogging friends are hard to find! Thanks Kari! It’s true, finding good blogging friends is tough! A lot of time I leave comments and *crickets*. Wink wink. Looking forward to seeing more from you! Wow! I bet this was a lot of work… and now you’ll have to keep it updated 😉 Ha! I’ll have to go through this and see which ones I’m not linking up to already! THANKS! Hahaha, I hope I can keep it up! I would love to add people as I run across their link parties. Thanks for checking it out. This is such a great resource! Thank you! Sure thing, Jennie! Hope you find some great ones that work for you. Awesome list… and I’ve added a couple to my party page! Thanks, dear heart!